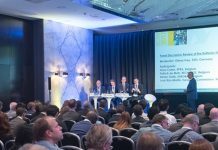 Lisbon, Portugal — What are the latest trends in the battery industry, which impact will increasing electric mobility have and what new developments are shaping the battery recycling sector? 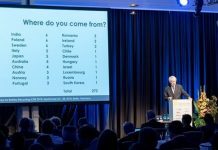 These questions and many more were answered at this year’s International Congress for Battery Recycling ICBR 2017, which took place in Lisbon, Portugal from September 20 to 22. More than 255 industry experts attended this annual sector meeting of battery recyclers – a significant increase that particularly reflected the heightened interest shown by both the automotive industry and the battery manufacturing sector. The industry representatives were treated to a comprehensive programme with over 30 talks and presentations on the agenda. The annual sector get-together also featured a workshop dealing with the safety aspects of transporting end-of-life batteries. The conference program was completed by a plant tour at the company Ambigroup Reciclagem in the Seixal Recycling Park. Among other points, in his keynote speech, Christophe Pillot, CEO of the French market research institute Avicenne Energy, presented forecasts of market developments in the field of rechargeable batteries up to the year 2026. According to his estimation, this year, for the first time more lithium-ion batteries will be deployed in power applications in the automotive sector than in the IT and consumer fields. A further keynote speaker at the conference was Professor Vera Susanne Rotter of the Technical University of Berlin, who provided an overview of the various materials that play a role in a circular economy, followed by keynote speeches held by Carlos Martins, Secretary of State of Environment Portugal, and Nuno Lacasta, President of Portuguese Environment Agency. One of the main focuses of this year’s ICBR was electric mobility and the treatment of end-of-life lithium-ion batteries. Jean-Denis Curt of the French carmaker Renault described how a closed loop system from e-mobility to recycling could look. Moreover, Willy Tomboy from the Belgian battery association Recharge and Tobias Schulze Wettendorf from Stiftung GRS Batterien shed light on the topics of take-back and product responsibility for industrial lithium batteries. New trends in the recycling of lithium-ion batteries were also presented in great detail. Achim Roesner of the Cologne-based management consultancy Berode and Professor Bernd Friedrich from RWTH Aachen University described which technologies are available for this purpose and how they differ. 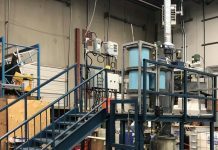 Furthermore, Norm Chow from the Canadian research institute Kemetco Research presented a new technology for recycling cathode material containing cobalt from end-of-life lithium-ion batteries. Additionally, Johan van Peperzeel from Battery Safety Solutions presented an innovative fire extinguisher for lithium and lithium battery fires. Marek Bartosinski of Accurec Recycling provided conference participants with insights into the practical daily business of a battery recycler. In his presentation he described the ecological challenges a company can face when recycling used lithium-ion batteries. W. Robert Kang from the American company Blue Whale Materials and Ajay Kochhar of the Li-Cycle Corporation also spoke about markets in other parts of the world outside of Europe, describing in their lectures how lithium-ion batteries are recycled in Korea and Canada. Additional topics of focus at the ICBR this year were again the safety aspects of how lithium-ion batteries are transported, stored and sorted. The Italian safety consultant Marco Ottaviani provided an update on changes to international transport regulations, followed by Michael Knobloch from the Munich-based company Genius Technologie, who presented practical solutions for the storage and transportation of damaged lithium-ion batteries. In a supplementary report, Robert Sonnenschein, CEO of Remondis Industrie Service, described how his company handles lithium-ion batteries. Again this year, the congress was accompanied by an exhibition that included some well-known names. The high popularity of the exhibition stands showed how important the personal exchange of ideas and information is at the conference. Next year’s conference will again provide ample opportunity to do so when the ICBR 2018 sector meeting takes place in Berlin, Germany from September 26 to 28, 2018.